Between the villages of Duck and Corolla is the pristine marsh of the Pine Island Audubon Sanctuary. Miles of secluded water trails make this arguably the most intricate marsh maze on the Outer Banks (8 square miles). 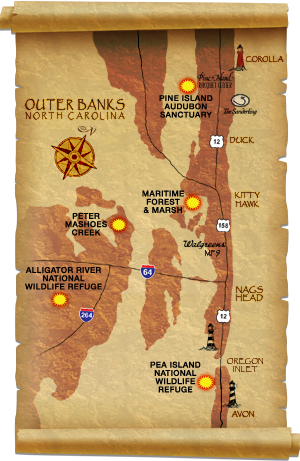 The National Audubon Society has preserved a piece of the Outer Banks as it was before man arrived. In their goal to save wildlife habitat they have also created a paddle boarder’s dream. One of the unique features of this tour is the solitude you will experience. Coastal Kayak has partnered with the National Audubon Society to offer this exclusive tour of one of the Outer Banks least traveled and most sought after wildlife sanctuaries. The tour starts with a 10 minute walk down the Audubon trail to the location of our paddle boards. From here your guide will lead you into the maze of islands through which only he or she knows the way. Tours are permitted from April through the first week of September and depart from the Pine Island Audubon Center in the mornings and a few hours before sunset. We are offering a 2 hour tour which cost $75 per person. Kitty Hawk Woods Coastal Reserve is one of few remaining maritime forests in the world. Over 1800 acres are protected providing a vital habitat for various migratory birds, mammals and reptiles. This tour meanders up Ginguite creek which is lined with loblolly pine and twisted live oak draped in Spanish moss. This sheltered creek remains very calm on even the windiest of days making it ideal for the first time paddle boarder or someone looking for a very relaxed nature filled tour. The northern route takes you into the heart of the maritime forest all the way to a covered bridge (the bridge to nowhere). This bridge was actually built by a developer who was poised to develop this desirable land. The Nature Conservancy purchased this property after the developer went into bankruptcy. Thanks to the acquisition, bald eagle and osprey, two formerly endangered species have begun to nest here again. In season (March – August), osprey sightings are a daily occurrence. Eagle sighting are less common, but have been on the rise since we started our tours here in 1999. Tours of Kitty Hawk’s Maritime Forest and Marsh run from March through December. Duration of tour is 2 hours. This tour meets at the Dare County boat ramp on Bob Perry Rd. in the morning and a few hours before sunset at a cost of $75 per person. Through our partnership with The Dock of the Bay Marina, we have gained access to the Kitty Hawk Bay and the Ablemarle Sound. 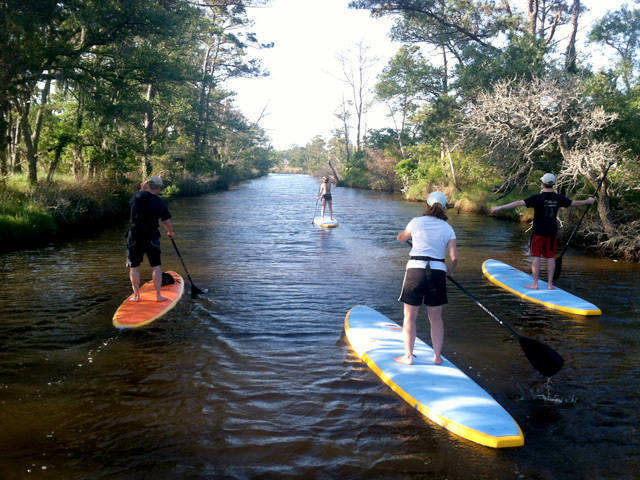 This tour departs from a sheltered creek which meanders out to the Kitty Hawk Bay. From here you will enter the majestic marsh trails of Long Point which empty out into the Albemarle Sound. 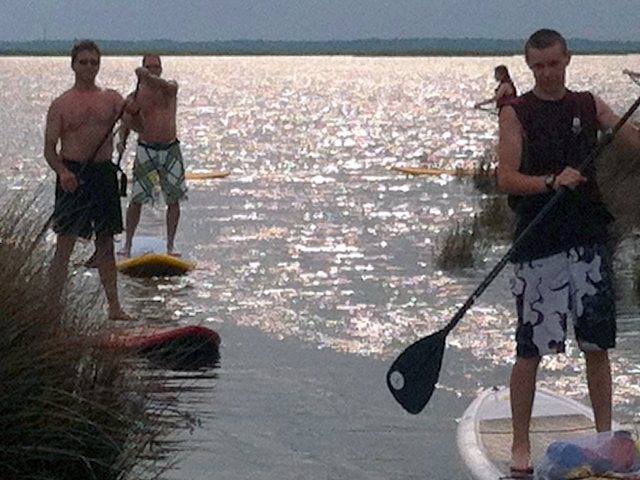 You will enjoy a brief open water paddle before making your return loop through the tranquil marsh trails. Long Point Marsh is an ideal habitat for river otter, osprey and bald eagle. 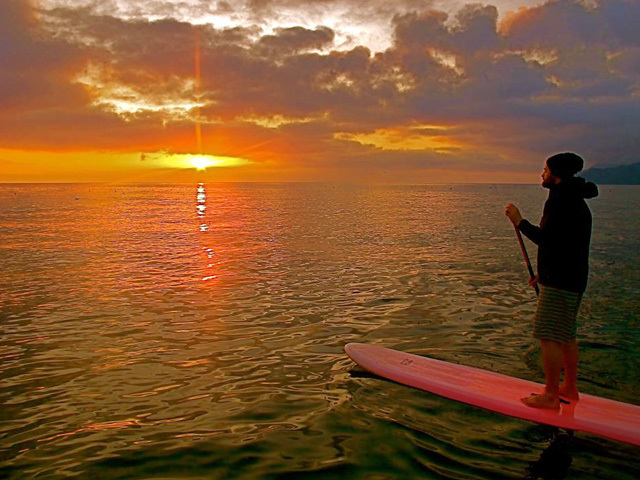 This tour is offered as a kayak or stand up paddle board (SUP) tour. SUP Tours cost $75 per person.